A mobile decontamination unit for firefighters in Morris Plains. Twenty sets of new gear for Pequannock. In Kinnelon, a trailer used for fire safety training with gadgetry that can create smoke, heat and fire, and even simulate an earthquake. Those are just some of the purchases that 13 volunteer fire departments in Morris, Sussex and Warren counties are making with $836,592 in federal funds earmarked for equipment upgrades and more training following the Sept. 11, 2001, terrorist attacks. "This is incredible. It would take us 10 years to get what we are getting in one shot," said Michael Geary, chief of Morris Plains Fire Department. Besides a hazardous materials decontamination unit, the department is using $69,953 in federal funds to buy new turnout gear and a diesel exhaust system for the firehouse. It will also cover the cost of a course for firefighters on handling emergencies involving weapons of mass destruction. In total, $12.4 million was distributed last year to New Jersey fire departments by the U.S. Department of Homeland Security for basic necessities, from the gear firefighters wear while battling blazes to the radios they use. Money will also be spent on public education programs, as well as training for responding to terrorism and arson, and the handling of hazardous materials. Fire department officials in Morris, Sussex and Warren counties say the money is being put to good use. Pequannock's volunteer department is buying gear -- boots, pants, coats, helmets and air packs -- with the $100,345 it received. In Kinnelon, $40,500 is helping the 70-member volunteer fire department purchase a 40-foot fire training trailer that can create different types of emergency environments, while allowing operators to teach fire prevention and escape tactics. The trailer includes a bedroom, kitchen, bathroom and living room. The department is providing $5,000 to cover the cost. Firefighters want to involve youngsters in the training, said former Fire Chief Pat Avello, who applied for the money last year. "These are valuable lessons they will learn, having children prepared, helping people come up with evacuation plans ... these are things that could happen in a terrorist attack," Avello said. Glenn Sisco, mayor and vice president of the fire company, however, said the department should have applied for money to upgrade its communication equipment. "The trailer is a nice thing, but is it a necessity?" he said. "And where do we park it?" But Avello said upgrading the communication equipment would cost $800,000. He said the department applied for state funds but was not successful. In Sussex County, six volunteer fire departments are receiving a total of nearly $422,000. The Lafayette Township Fire Department received $122,767 to buy a new 3,000-gallon tanker truck. In rural areas like Lafayette, departments rely on tankers to haul water to fire scenes. Lafayette's grant will pay for about 90 percent of the cost of replacing a 33-year-old tanker, said Fire Chief John Strowe. Newton Fire Chief Jim Issler and former Chief Mike Alvarez said their department will use $137,565 to buy 50 sets of turnout gear -- helmets, boots, pants coats and air packs. The equipment will replace gear that is a dozen years old, they said. "A lot of things have changed since the last time we bought it. There's been a lot of changes and innovations" in gear, Issler said. "And with the amount of drills and training we do, too, it wears the equipment out pretty quick." In Warren County, departments in Oxford, Washington Township, Washington Borough and Independence townships received federal money. Washington Township Fire Chief James Vergos said his volunteer department will use the $51,149 to upgrade old air packs and buy new ones, and on two-way radios and masks. "As a volunteer department, it's a gift sent from heaven," he said. "All these municipalities, they're all tight on their budgets." Staff writers Jim Lockwood and Sally Goldenberg contributed to this report. New Jersey fire departments have received nearly $12.4 million in federal funding during the last year as part of a national effort to upgrade equipment and improve training in the wake of the terrorist attacks. The money, which is being doled out by the newly minted U.S. Department of Homeland Security, can be used for a variety of basic needs, from new breathing and communications equipment and fire trucks to training programs and public education campaigns. Tom Olshanski, a spokesman for the U.S. Fire Administration, said one of the most important lessons learned from Sept. 11 is that firefighters are on the front line in the war on terrorism. "It isn't the federal government or National Guard that is first called out," Olshanski said. "It is the local fire department, police department and emergency medical personnel that respond." For that reason, Congress authorized the Bush Administration to spend up to $750 million in the 2003 fiscal year on the Assistance to Firefighters Grant Program. The Fire Administration has already given out $604 million since June, and expects to hand out the rest by this June. Another $750 million is being readied for the 2004 fiscal year, which started Oct. 1, Olshanski said. The federal government wasn't always so generous with the nation's firefighters. The Assistance to Firefighters Grant Program was established in 1974 by the Federal Fire Prevention and Control Act of 1974, but it was never funded. In 2000, however, Congress passed legislation sponsored by New Jersey Rep. William Pascrell (D-8th) to provide grant money to the nation's fire departments. The Firefighter Investment Response Enhancement Act, attached to the National Defense Authorization Act, initially called for spending $5 billion over five years. But the bill, which was signed into law by President Clinton, provided just $100 million in grants in 2001. "Long before 9/11, firefighters were always the forgotten part of the public equation. 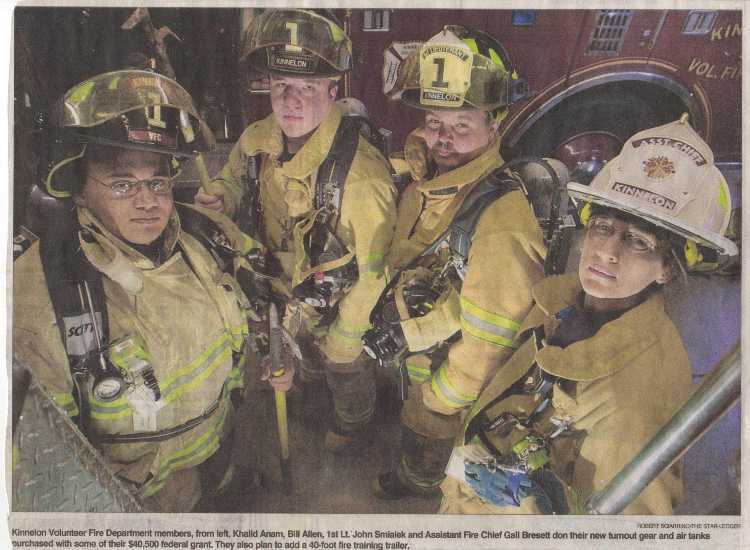 There was a need for equipment, training, apparatus, personnel, that the communities could not address," Pascrell said. Following the terrorist attacks, Congress increased the fund in 2002 to $360 million, and $750 million in 2003. The agency has handed out a total of $21.3 million since 2001 to New Jersey fire departments. Ben Quevedo, a spokesman for Homeland Security, said the fire grants are part of the nation's response to terrorism but are not termed "anti-terrorism" efforts. "They are preparedness grants," Quevedo said. Craig Sharman, director of government relations at the National Volunteer Fire Council, a lobbying group based in Washington, D.C., said that his organization was very satisfied with the grant program. "We're pleased with the fact that the grants have gone directly to the fire departments, not to the states, to address the basic everyday needs of fire departments of all sizes in all communities," he said. Pascrell said while the Bush Administration is now trying to reap credit for the program, it actually tried to eliminate funding for 2002 but was stymied by a bipartisan revolt in Congress. The administration then tried to roll the funding into general Homeland Security revenues, but was again stymied, he said. Sharman said when the Bush Administration did propose zeroing out funding for the program, his organization and others representing firefighters worked with Congress to reinstate the funds, successfully getting $360 million that year. "The following year, the administration had $500 million for it but tried to roll it into another program, and we fought to keep it separate," Sharman said. "Eventually, the administration, through Tom Ridge, said they would keep it separate. We changed the administration's opinion on that because of the actions of a lot of firefighters from across the country," Sharman added. Chad Kolton, spokesman for the Office of Budget Management, said there were subtle differences on how to disperse the money to first responders, with the Bush administration strategy to fund fire departments as part of an overall state and regional homeland security plan. "But priorities were set up so that the funds that were to be there for the first responders are there for them, and we worked with Congress each year to make sure the money was there," Kolton said. "The president has an unparalleled commitment to first responders," he added. The grants are awarded on a "neediest basis" first and must be given on a basis that reflects the proportion of public protected by paid, volunteer and combination paid/volunteer departments. Currently, 56 percent of the population is protected by volunteer and combination departments and 44 percent by professional firefighters. Grants can be used to fund 14 activities, including hiring and training personnel, purchasing equipment and vehicles, fitness and wellness programs, modifying fire stations, enforcing fire codes and public education efforts. Municipalities of less than 50,000 residents must put up a match of 10 percent for each grant while those with more than 50,000 must put up a 30 percent match. Olshanski said fire companies are encouraged to cooperate regionally when applying for equipment. "If there are equipment holes, say one company in a region has a need for thermal imagers and another a need for breathing apparatus, they should get together and work together, with one getting the imagers and the other the breathing apparatus. "They should look to fill as many holes as they can and share those abilities regionally," Olshanski said. Patrick Jenkins works in the Middlesex County bureau. He can be reached at pjenkins@starledger.com or (732) 404-8090.